Route 24 seems to be a hot scene for car accidents in Boston. On one recent day, a car sat still in the right hand lane, with its rear end completely shattered, while another vehicle sat about a quarter of a mile up the road in the median with some serious damage. This isn’t just an isolated event either. Oftentimes, traffic on the popular Boston roadway is flooded with smashed vehicles, resulting in heavy traffic. Still, many Boston residents prefer using this dangerous mode of travel, according to Enterprise News. “You’ve got a lot of people speeding, people on their cell phones, girls putting on makeup…it’s nuts,” said Dan Reyes, a daily commuter from West Bridgewater to Braintree. Our Boston car accident lawyers understand that a good portion of commuters still prefer to drive alone to work on our dangerous roadways, especially including Route 24, according to recent census data. Numbers illustrate these drivers venture on quite lengthy daily commutes. Bay State drivers average approximately 30 minutes to get to each of their daily destinations. This is more than workers in the 46 other states. Others venture on longer commutes, on more congested roadways with increased risks for serious accidents. These statistics illustrate that most residents don’t live near their place of employment, except for those in Nantucket who average a commute of roughly 10 minutes. Nantucket residents average the shortest commute in the state. -In Brockton there are nearly 43,000 workers. -Nearly 34,000 drive alone to work every day. -Nearly 5,000 residents car pool their way to work. -Almost 3,000 take another form of transportation. -More than 1,000 walk to work. -More than 72 percent of workers drive alone to their job every day. The result of these statistics means that the area’s main highway, Route 24, is highly congested and extremely dangerous during prime rush hours. From 2006 to 2008, there were more than two rollover accidents a day and there were nearly 2,500 accidents recorded by officials during that time. Route 24 could be safer for commuters, but unfortunately it won’t be. 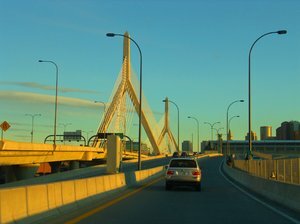 The popular Massachusetts highway won’t receive federal funds for redesign because it’s considered as a “limited access highway” instead of as an interstate. If this roadway does on day get designated as an interstate, transportation officials can potentially consider a few ways to make the road safer such as modifying interchanges, which carry the highest rates for accidents on that roadway. Until roadways are constructed to be safer and handle higher volumes of traffic, motorists are warned to drive with caution, especially during rush hour. Car accident risks can be reduced by practicing safe and defensive driving habits. If you or a family member has been injured in in a traffic accident in the Greater Boston area or elsewhere throughout Massachusetts, contact the personal injury lawyers at the Law Offices of Jeffrey S. Glassman, LLC for a free and confidential consultation to discuss your claim. Call 1-877-617-5333.